The detailed model presented is a development of an exponential store model (TOPMODEL) previously described (Beven and Kirkby, 1979). The continuity equation for saturated sub-surface flow is expressed in terms of unit runoff which emphasizes the relatively low spatial variation in rates. For this reason kinematic wave solutions have not been used to solve the partial differential equation. A single unsaturated and a saturated store are considered at each point down the hillslope length, the former delaying infiltration and the latter providing downslope sub-surface flow and establishing saturated contributing areas. The total sub-surface flow at saturation, slope gradient and hillslope plan form are used to generate flow differences down the length of the hillslope profile. Simulations show the generation of saturated overland flow at downslope sites where flow converges, superimposed on a hydrograph which is largely controlled by the convex (in profile) divide area. This suggests that for most natural slopes, the runoff delivered to channel banks may be estimated efficiently from two separate linked component models. The first forecasts spatially uniform flow at rates determined by topography and soils in the hilltop divide areas. This model is able to forecast the changing saturated area on which the second component model forecasts the saturated overland flow. This or another appropriate hillslope flow model may be combined with a flow routing algorithm for the channel network to give catchment hydrological response. 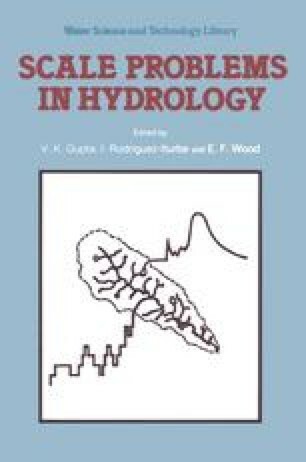 In simple cases of spatially constant network routing velocity, the resulting combined model is identical to the Geomorphological Unit Hydrograph of Rodríguez-Iturbe, providing an explicit physical meaning for his theoretical unit response functions as the hillslope base unit hydrograph.